We were drawn against Cerberus for our first fight. Cerberus was a nicely made machine, powered by a couple of Bosch 750 motors, with a Kevlar body shell. Unfortunately they had to remove their Tungsten Carbide tipped circular saw blade before the fight, as these are not allowed for fear that the TCT tips could fly off. They went out to some local DIY shops to try and find a suitable non-TCT blade, but couldn't. One of our front tyres had been ripped off (I had made them too narrow) and I was having real problems steering. I went on a circuit of the arena to get back to face them head-on, and drove across what I thought was a black panel on the floor, when KHz suddenly disappeared! 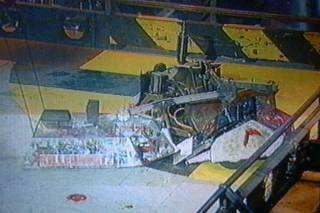 I immediately realised with horror that of course it wasn't a black floor panel, but the dreaded pit! So that was us knocked out of Series 3. In the pits afterwards we saw how close we had come to defeating them. The spike had gone right into their ally radio box, and knocked it off its mountings, but in a section that was empty. They were lucky! 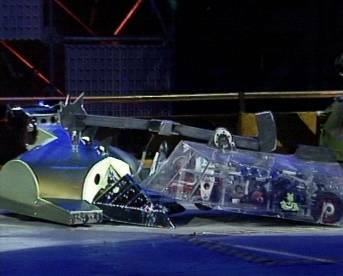 In the World Championship (Video, 'Robot Wars The First World Championships' now available to buy in the shops), which took place after the filming of the main competition, we were chosen to represent the Czech Republic, for the entirely justifiable reason that Dominic is half Czech! There were also teams from the 'States (The Mauler and Prometheus), Belgium, Holland and Australia. We were having a good little tussle and then Chaos got wedged in a corner by Shunt. Dominic got a direct hit on them with the axe and then Sgt. 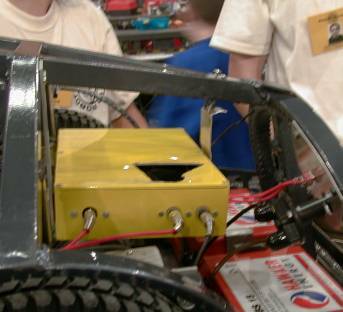 Bash got several hits on their rear panel, one of which seemed to pierce their CO2 tank. The match was immediately halted, and we thought we might have won it, but they then realised that it had only temporarily released some gas, so we carried on. The spike, however was rather well embedded in Chaos and in the struggle to release it, the axe chain tensioner gave up and the chain slipped, rendering the axe useless. Chaos then managed to flip us and we couldn't self-right without the axe. Again, back in the pits we saw the damage that we had done. 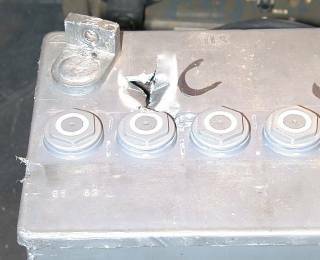 The spike had gone through several layers of polycarbonate and pierced one of their main drive batteries, but hadn't caused enough damage to stop them.